Idske's Miniatures: Tulip vase or Tulip vases? Tulip vase or Tulip vases? I've just come back from the pottery class completely exhausted, but reasonably happy with the result. No glazing as yet as that is done just before there is a firing and let's face it my little pots aren't going to decide when that is! 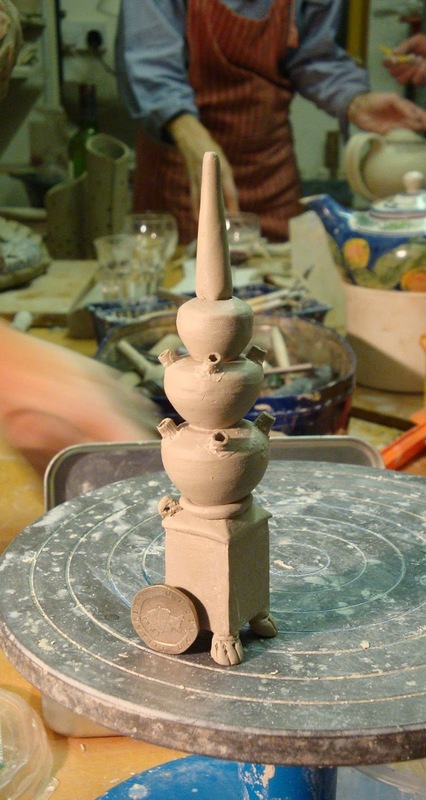 I suppose it's about half way, as it still needs the spouts on the top pot, some decoration on the base of the obelisk so it will stay in place and scrolls on the corners of the base pot, probably a touch bigger that the one I tried out on the left hand corner. You'll have to enlarge the photo to see it. I have to keep reminding myself that it will shrink about 10-15% on the first firing. It's looking fantastic Idske! Great to see these early stages. I can only imagine how difficult this must be! It looks wonderful Idske, I love the feet on the bottom vase. Ooooeeeeeh, knap gedaan zeg, Idske, geweldig!! Het ziet er vooralsnog prachtig uit! Veel succes met dit mooie project. I am gobsmacked, Idske! I have read your posts up to this one but will surely be back :). Thank you for taking the time to comment on my blog and for following my work .